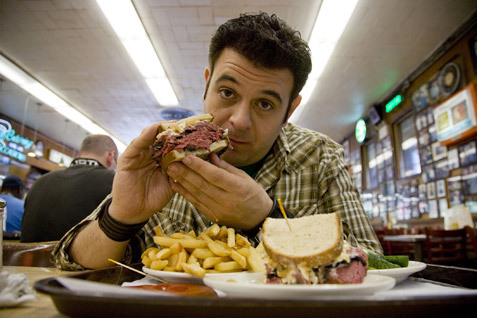 Let me begin by saying that I liked Adam Richman before liking Adam Richman was cool. I’m not certain at all whether it is cool to this day, because that’s how uncool I am, but I do find Adam likable. I used to eagerly watch his show Man Versus Food Nation not for its sort of dumb eating challenges that were pretty disgusting and seemed to make even Adam cringe a bit, but for his witty banter with popular regional food purveyors. He was respectful, he could be funny without being obnoxious, he was a super cute teddy bear of a guy from Brooklyn and the kind of person it would be fun to grab a bite with, thumb ring aside. Then came the re-boot of his show, in which Adam traveled to different cities, met said purveyors, hung out in their kitchens as they did their thing, then had some shmo end up doing the food challenge. I’m not sure if Adam got tired, got sick, or was just over it, but the formula of the new show just didn’t work. Who cares if some random guy can or can’t eat 27 hot dogs? So, the re-boot was booted. Finally, Adam 2.0, in what I can only hope was his original idea: Best Sandwich in America. The concept: travel the country sampling the most popular sandwiches from ten US regions, run them through something called the “BITE Scale”™ (B – Bread; I – Interior; T – Taste; E – Experience), then pit them against each other in a sandwich death match in which there can be only one national champion–a sandwich “to rule them all”. First problem, pitting regional specialties against each other is like asking the Seattle Sounders play the New York Yankees. Yes, they are both games played with balls. But an oyster po’ boy should never, ever, be compared to a tuna on rye. They are two different food concepts in terms of ingredients, execution, and taste. It’s insulting to the makers of these gifts to compare them. Would you compare the Mona Lisa to Munch’s Scream? You would not. Another instance where I take issue with Adam’s shows is that I can’t figure out who exactly encompasses the Richman demographic. I can only gather that it’s young college dudes and huge stoners, because never have I seen larger, more gloppy, giant sandwiches. The one smothered with a layer of french fries really stood out. Attention Food Network: not everything has to be huge all the time. Wouldn’t it be nice to show a normal-sized sandwich served with fresh ingredients, maybe even…vegetables? Roasted pork with broccoli rabe and giardinere doesn’t count (although that was my favorite, and coincidentally – spoiler alert! – the winner of the competition). What’s still good about any show with Adam is Adam himself, his easygoing repartee with chefs and patrons and his enthusiastic introduction of these passionate artists to the world. I will definitely seek out almost every sandwich on his list when traveling (splitting it with a partner, hopefully), just to see what all the fuss is about and to meet characters who have in many cases devoted their lives to doing one thing really well. Which brings me to Adam 3.0. Not for nothing Adam, simply an idea for the future. Try not to make it a competition about who’s bigger, better, etc. Travel around, meet great chefs, and talk about the infinite variety of delicious food we have everywhere in this country. Keep focusing on local dishes that make people rhapsodize and wait in line for hours. Take a page from your chef friends: do one thing really well. And for the love of god, man, lose the thumb ring already.